Senator Ademola Adeleke joins Osun guber race – Royal Times of Nigeria. The Senator representing Osun West, Ademola Adeleke, has declared his intent to run for the governorship position in Osun state. The lawmaker made his intention known in a letter written to the Osun state chapter of the Peoples’ Democratic Party (PDP). 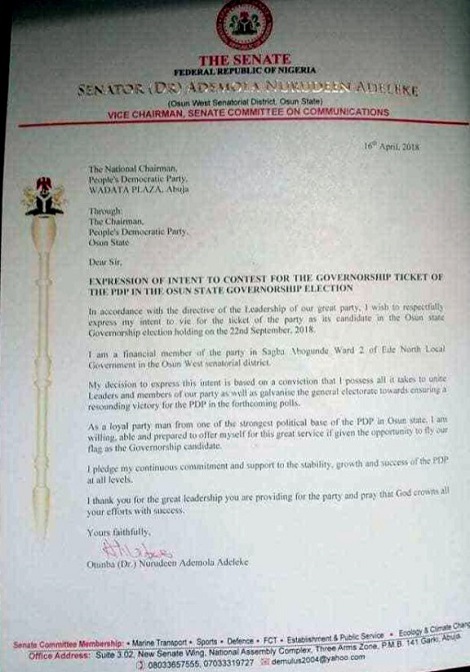 Mr Adeleke, in the letter said his intention was based on his conviction that he can unite the party in the state. He added that he has the ability to galvanise the general electorate towards ensuring a resounding victory for the PDP in the forthcoming polls. He urged the leadership of the party to give him the opportunity to fly its flag in the forthcoming gubernatorial election in the state and see the party come out successfully.